From the over-the-top lobby of carved wood and inlaid marble to the spectacular panoramic views of downtown and the bay the amenity-filled Manchester Grand Hyatt San Diego is held in high regard by our guests. This 40-story two-building luxury hotel offers a staggering 1625 spacious rooms and suites including non-smoking and smoking options hypo-allergenic rooms and pet-friendly floors to ensure they have every guest covered. Along with those trademark plush beds all accommodations offer 46-inch HDTVs windows that open to let the sea breeze in and remarkable views all the way around. The amenities here go on and on starting with multiple on-site restaurants bars and lounges. There are two tennis courts and a top-shelf fitness facility on-site. Valet and self-parking are offered for an additional fee and pets are allowed also for an additional fee. The hotel offers the ultimate downtown waterfront location â?? it's just steps to the oh-so-quaint Seaport Village and a three-minute walk to the light rail taking you all around downtown. 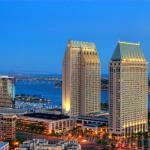 Take a 10-minute walk to the Gaslamp Quarter the Convention Center Horton Plaza and the bay cruise boats. San Diego International Airport is only three miles away.